Hawai'i has always been one of those destinations where I dreamed of going, but never knew when it could actually happen. Until it finally did last month. And my heart is still in Oahu, right where I left it. I've never felt such post-vacation blues as I have until this trip. When I travel, I tend to pack the itinerary, filled with things to do, events to attend, and shows/games to watch—in between all the meals, of course. This time, I knew I had to take it easy, and I'm so glad I did. There were times where we didn't have anything specific to do, but was fully content with just lying, and sometimes even napping, on the beach because it is just that nice there. Keep reading to see all hikes and beaches we explored! Of course, hiking had to be on the list of things to do. We hiked Diamond Head first—one of the three planned hikes. A friend said that even though it is touristy, it is still worth it, and I totally agree. I mean, look at this view of Honolulu! The hike isn't too challenging, until the last stretch. You can either walk up STAIRS after STAIRS in the cool shade/indoors, or go the other much easier route, but sweat under the blazing sun that is only getting hotter every step of the way. We opted for the former. I believe we started around 8:30 or 9 in the morning, and it was fairly crowded up at the top. I wouldn't recommend starting any later than that though, as I'm sure it'll likely be even more crowded AND hotter temperatures. The next morning, we hiked up to the Lanikai Pillboxes to watch the sunrise. We arrived around 5:30am to ensure we get a close parking spot. After we parked, we ended up meeting a group of four others who was familiar with the trail and was OK with us tagging our newbie-selves along. And boy, were we grateful for that. This is QUITE a strenuous hike—there are even ropes set up at some parts to help you, you know, not totally tumble down. And the trail isn't entirely obvious, especially in the dark. Given the ropes and the rockiness of this "trail," I urge you to bring a headlamp. I was able to make it with my phone, but it was more challenging having to climb with a phone in my hand. Because you are hiking in the dark, I also recommend you tagging along with someone who knows the way up, or hike it once yourself when it's actually light out before doing the sunrise. I just can't imagine how we would've done it alone for the first time. Given the time of the year we went to Hawai'i, we lucked out on the weather as much as possible during this hike. Right before we got out of our car, it started heavily drizzling. On the way up, the drizzle would come and go. In fact, we saw rain clouds pass by when we were at the top (you can see it if you look closely at the clouds and water in the video above). We were just so fortunate that it didn't come toward us, but went the other way instead. Phew! It was a crazy hike up, but it was so worth it. Now that I've done the sunrise hike, I have to say I'd love to see the sunset version. By the time we were done with the these two hikes in back-to-back mornings, we were just exhausted, and the thought of waking up early again to do another hike sounded terrifyingly exhausting. We decided to sleep in the day we had planned for Manoa Falls, but unfortunately, the weather didn't cooperate the rest of the days and we never made it there. That's OK though—this is just another reason for us to go back. We're happy that we did the two hikes that we were able to. 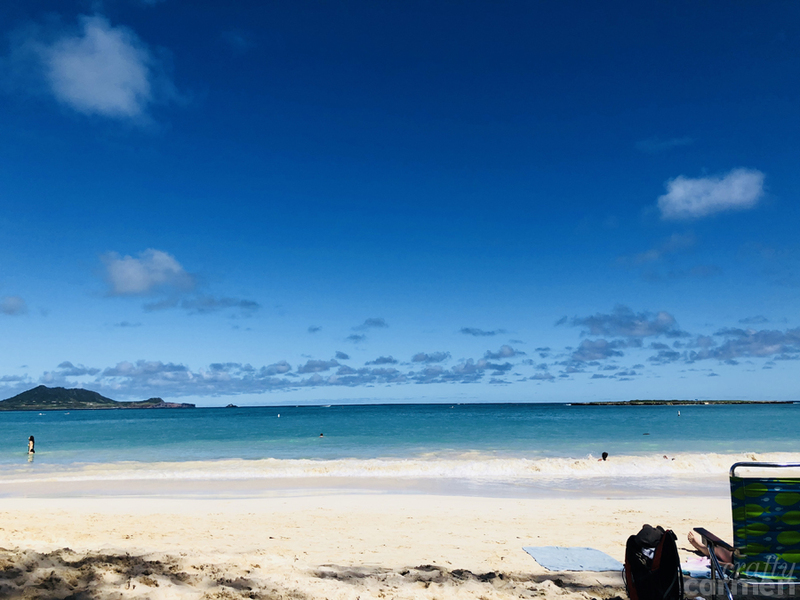 Once you are done and ready to relax after the Pillbox hike, head to Lanikai Beach, which is the most gorgeous beach I've been to anywhere so far. It is not crowded at all. Dogs swim and play there. Just look at this beauty. The only thing is that there really isn't any shade here, so it could get too hot if you don't have a beach umbrella or tent. An alternative to Lanikai Beach would be Kailua Beach Park, which is about ~1–2 mile away. This place is a little more crowded than Lanikai, but there are shades and restrooms if you need them and the view is quite similar. When you don't have something specific to do in Hawai'i, you just say, "Find a beach, find one somewhere, anywhere." And that's how we ended stumbling upon Queens Surf Beach twice, It is right next to Waikiki Beach, but nowhere as crowded. At Ala Moana Beach Park, the water was warmer and clearer than Lanikai and Kailua. Like I mentioned, one of the things I loved was napping on the beach without any worries. We did that here, and you know what? There was nothing like waking up to the waves gently crashing, palm trees slightly swaying, and a sun beaming. Talk about paradise. The last beach I want to share is the Laniakea Beach, aka Turtle Beach, in Haleiwa (North Shore). Crowd level here was low, and the main attraction is the sea turtles, hence the nickname. Once you get here, you park across the beach and run across a busy highway. A little scary, but definitely doable. I believe depending on the time of the year/day, there are quite a few sea turtles. However, there was only one when we went, and there's someone there "supervising" her so she stays safe. Can’t wait for my next trip to Hawai'i!